Hey everyone! It's Day 6 so naturally the best of the best (Kate and Lena) are blogging on their favorite day of the week….Thursday! Thankfully, last night we were all fast asleep well before 11 and despite the constant snoring courtesy of Erin, we woke feeling refreshed and ready for a new day with new tools and new people (by new people we are referring to Erica). The morning started as usual with a quick chat where everyone went around and said what they had learned themselves, and what they had learned about someone else. After, we split up into 3 different groups, Pete's group was digging a trench to prep to pour concrete, Jeffrey's group continued to frame, and Erica's group was responsible for hanging up fireproof sheet rock. 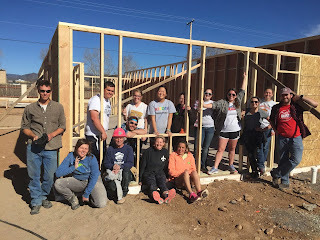 As a group, we decided that it would be cool to order Santa Fe Habitat for Humanity shirts, so yes that means we will all be coming home with one more shirt in addition to the twenty others that we packed, sorry Mom and Dad. Time got away from us and before we knew it, it was lunchtime. After enjoying a quick lunch, Rob, the site leader, led us in a "Getting to know you" activity with the regular site members and a group of individuals from YouthWorks. 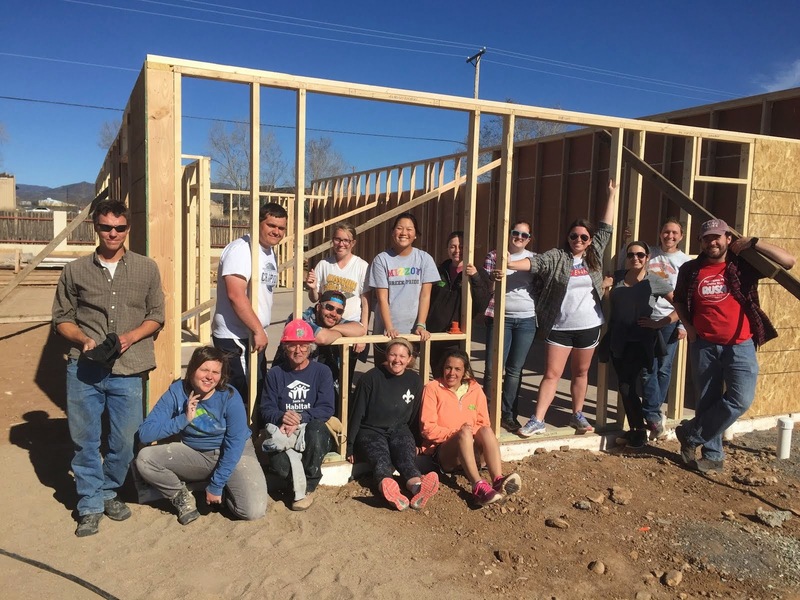 For those of you who don't know, YouthWorks is an organization for at-risk and disadvantaged youth in Santa Fe. The activity started off with an inner and an outer-circle where everyone was paired up one-on-one with another person who was serving. Our group started on the inner-circle, and when prompted by Rob we were instructed to answer according to the question. The people on the outer-circle were told to let their partner talk and to only ask more questions to further the conversation. After we were matched with everyone on the outside, we switched places with them and became the outer-circle and were given the opportunity to connect with everyone on a personal level. Our prompts included light questions like our favorite food and favorite place to visit, as well as heavier ones like our opinion of teen pregnancy, religion, and where we saw ourselves in 5 years. Our day wrapped up after what seemed like tireless work and finishing up the last few tasks for the day. We cleaned up and headed home to get ready for dinner. A few of us quickly jumped into the shower and the others headed to the Plaza to check out the shopping. After we headed out to dinner at Gabriel's where we had a whole room with a giant round table set for 15 for ourselves. Why 15 you may be asking? We invited our friends from the site to join us for a nicer dinner, yeah we even wore something other than shorts and a t-shirt! And of course it wouldn't have been a trip out to dinner without a slew of intriguing conversations on our way to drop off Erica and Jeffery. Did we mention we also told the restaurant it was Emmitt's birthday and they put a sombrero on his head and sang to him in Spanish? That was pretty funny, check out our Twitter (@MAB_SantaFe) for a picture perfect, Kodak moment all thanks to Kate from the ordeal. On a side note, 6 of us, Kate and I, Emmitt, Erin, Evan, and Alex are discussing how Erin likes to eat frozen pancakes with peanut butter….she even compared them to "cookies". Five minutes after we thought the concluded Erin says, "You guys should just give frozen pancakes and waffles a chance". Okay Erin. Don't worry we're forcing everyone to liberally apply sunscreen and aloe! I think this is where we say goodbye, so until tomorrow…Stay Classy Santa Fe!